Animal health supplements that provide solutions for vets. 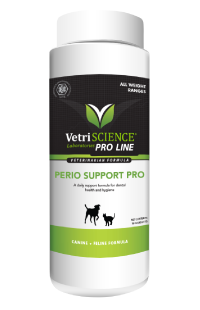 Perio Support Pro is a tasteless, odorless powder that's easily sprinkled over meals and clinically proven to reduce plaque by 20% and tartar by 18% in less than a month! The raw materials we use are of the highest level of quality and purity. Our ingredients are strictly evaluated prior to approval for use in our formulas to ensure that all of our products are safe and effective. You will receive new product announcements, money-saving deals and helpful information approximately twice a month. We pledge total truth in labeling. All of our products contain only the purest and most potent ingredients. Guaranteed.